The Seiko Grand Quartz first appeared with four models in the 1975 Japanese Domestic Market (JDM) catalogue, in white and yellow gold only. One should not mix these up with the Quartzes of 1974, the 38SQW V.F.A, 39SQW V.F.A or 38QTW, 39QTW, -QRW, QRC, QT etc. Prices of these would vary… but the Grand Seiko was now only second best, depicted here in the ’74 catalogue as cheaper, as separate and to the lower right of the new fangled quartzes! The SQW and later on the Grand Quartz (more commonly known as GQ) ranged in price between 460,000 (leather band) and 1,350,000 Yen bracelet). The automatics of Grand Seiko comparatively all sold for 500,000 Yen or under, even the gold plated one depicted. As was convenient with seventies style quartzes, the case back has a battery hatch and inside we can find the trimmer for the fine tuning of the movement. In the next decade, at the beginning of the eighties, the battery hatch was eliminated, as batteries were longer lasting, and the back plate was introduced. The crown is also signed with the double honeycomb. In all four different GQ caliber series were introduced. The 48, 92, 94 and 99 series. The Grand Quartz 48SQW in 1975 was depicted right next to the King Quartz 08KQW, all white and yellow gold. The 48xx was a very solidly made quartz with a production span of just four years. In the first year of its production in 1975, only this Grand Quartz reigned supreme right next to the Quartz V.F.A with just three models, 8000/8010/8020, there were no other GQ calibers! The models 8030/8040 were introduced later in 1975 and made for just three years; they came with a thick steel band for the 4843 and with leather only for the 4840 & 4842. That setup never changed for this caliber. Even when the much daintier 48xx-8110 variation was introduced in 1977, ending the 8030/8040 production run in that year. 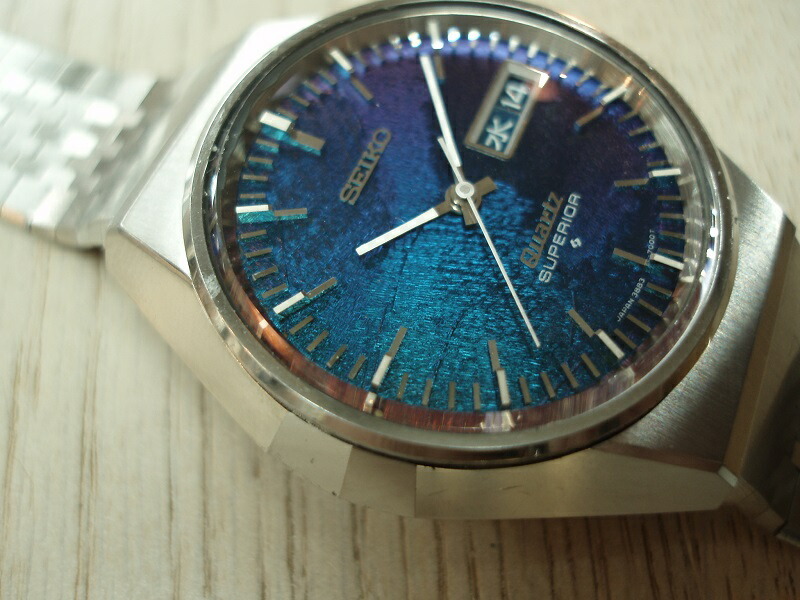 In 1978 Seiko introduced the twin quartz 9943, ending all of the 48xx caliber that year. The 48xx of the year before however remained a thicker and wider flaring watch (38x43x11mm!) and was more robust than its 9943 descendant - it is after all a Tanaka design. Therefore it already has a huge presence, apart from its very modern dimensions. This is also translated into the bracelet mentioned, which was uniquely designed for 1976/77 only. It is a very heavy, very tight bracelet - almost like those of the King Seiko Vanac of the day. The 48xx-8041 for instance has a definite "butch" personality to it as evidenced by its measurements of course... It is the definite early king of the 48s, as other variations like the 8110 are already smaller with lugs of 18mm instead of 19mm and dimensions of 36x40x10mm. Only one question now remains to be solved, there seems to be a slight variation between the 48xx-8040 and 48xx-8041... Apart from that pecadillo, this watch is thoroughly understood and functioning perfectly - a true testament to the unparalleled quality of these early Seiko Quartzes. Describing this watch reminds one of just that. For instance, the thermo-compensation, due to its relative thickness, is usually still excellent after all these years. The dial work of course is impeccable, truly a high end watch. And notice the black striped hands? It gives this watch something extra..... great legibility and some "punch". And that punch is also implemented in the mechanics of this watch, it has that special Seiko gimmick of the "jumping seconds hand". This means that it will jump ahead 10 seconds when you pull the crown to adjust the time. It makes time setting so much easier! The Grand Quartz at hand is fully original with an original bracelet, is not polished and runs to specs. In my experience these single quartzes are among the most accurate vintages; the twin quartzes like the 99 series mentioned have the specs for sure, but after 40 years or so… build quality and robustness gain the upper hand. The early Grand Quartzes truly shine! This does not mean there were not a slew of other quartzes, but they were less or more expensive variations. But hey, they were all quartz, right? Now confusion reigned… so what would constitute the difference in quality? Casing? Battery life? Accuracy, complications? Not really, but later on Seiko differentiated its product lines dramatically to the relief of many. The indications SQW, KQW, QQW, QTW, QT, QTC etc. were dropped, only ever to be used again by the discerning collector. One could now see the developing quartz lineage in the next four decades. Part of that development, as stated, was that quartzes were getting thinner and, dare one say, less masculine. The 48GQ was a nice chunky and angular watch – not big, but with a huge wrist presence (case thickness could easily get up to 12 mm!) The 9940, or generally, the twin quartzes, could not be daintier. A lot of those were beefed up with raised markers, blackened or whitened hands, sturdy dial work etc. But still, the casing got more and more spoofier. The case as flat as 7 mm. Another part of the development was consistent numbering. 92, 94, 99 were the different calibers; but then 9940, 9942, 9943 would mean respectively no date, date only, day/date. Another example is the model indication: 9940-8000 is simple and classic design with the lugs open to a strap; 9940-7000 with bracelet; 9940-5000 is a square (does not exist– the 9256-5010 however does), and the 4843-5100 is a day date square with lugs open to a strap. So, there are many model codes, and one does get to know them eventually, do not despair. The no date 9940 was first released in August 1978, right next to the 92 series, released in December 1978, and closely followed by 9256. (Just under a year later the maverick 96 series was released in September 1980 as caliber 9641A and 9642 as an inconspicuous Seiko Quartz - a true wolf in sheep’s clothes). Hot on its heels was the 94 series released in November of 1980 (9461, 9441A), also in a simple quartz flying under the radar - but finally ending up in the Lasale and King Quartz. In 1978 the aforementioned 9940, was first produced, right next to a more expensive mysterious caliber from Daini, the 9256 (last seen 1981). This watch would cost you about 1380 dollars nowadays for the superbly dialed 9256-5010 model or the 9256-8010 with integrated bracelet. Grand Seiko money indeed. With an accuracy rated at 10spy - the same as today's Grand Seiko cal. 9F - the 9940-8000 (and the 9256) is shown for the first time in the JDM 1979 V2 catalogue, on page 6 priced at 75,000 Yen. In todays money that would be some 940 dollars. There's only one other reference with the cal. 9940 in the catalogue and it is on page 4, the 9940-8010 with gold-plated case, leather and gold dial, setting you back 90,000 yen. There are minimal changes in the next few years, until finally 1985, after which both the Superior and Grand Quartz lines aren't present anymore in the catalogue - moreover, there are no other models with twin quartz calibers on it. It is certain that the entire production of the Grand Quartz line spans no more than a decade, 1975-1985. For caliber 9940/9943 however just 6 years. All of these watches have the strong lines and angles typical of the Seiko productions of the Seventies (although as mentioned not as masculine as what went before). The dial has the indices and the Seiko logo both applied and at six o'clock there is the "double honeycomb" logo, indicating the presence of a "twin quartz" caliber inside. A feature of this particular caliber - you know it by now - is the total absence of any day and date indication; maybe this is why watches running the 9940 are quite scarce. Watches made with the 9943 (day/date) are rather more common. Remember, during the entire production run we have only two 9940 models (9940-8000, 9940-7020), and two with the date-only 9942, but thirteen with the 9943. An interesting feature is the way all 99 series twin quartz models work. These models use one of the crystals for the timing accuracy and the second crystal is used to detect the temperature. These two values are then combined in a processor to calculate the correct timing offset. This method allowed extremely accurate adjustments with all the models achieving the following yearly variations, the Superior with 9980A and 9983A +-5 seconds, the Grand Quartzes mentioned +-10 and finally the King Quartzes 9920A 9921A and 9923A at +-20 seconds. Those are probably the best vintage buys you might get. I am amazed at how Seiko always outperforms any other watch in existence. Name your watch and I will name the Seiko that does it better. It is just that I like variation. Don't go down the Seiko rabbit hole! (05-24-2017, 07:52 PM)Harry Wrote: Those are probably the best vintage buys you might get. I am amazed at how Seiko always outperforms any other watch in existence. Name your watch and I will name the Seiko that does it better. Nice write up here - thanks for all the info. Updates to the main article! Indeed, best of the best these watches - I usually find the Superiors a bit bland and limited in design compared to the GQ range. (04-01-2018, 08:54 PM)Insofar Wrote: Indeed, best of the best these watches - I usually find the Superiors a bit bland and limited in design compared to the GQ range. That is going to cost you over a 1000 euro to get it shipped... I am starting to think it is worth it as I like these more than any modern Grand Seiko Quartz. Great watches, great write up of the Grand Quartz. Enjoyed reading that..